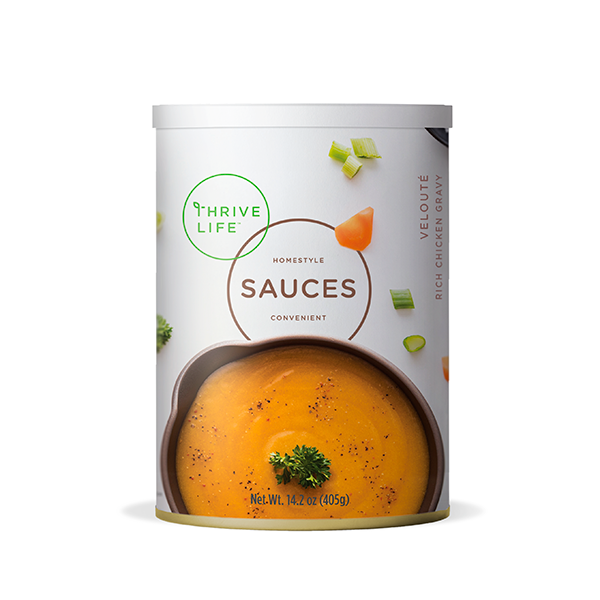 Making rich chicken gravy is a breeze with THRIVE Velouté sauce! It’s just the thing for chicken dishes, pot pies, and casseroles. MALTODEXTRIN, MODIFIED FOOD STARCH, CREAM, WHEY, SALT, CHICKEN FLAVOR, ONION POWDER, CARROT POWDER, CHICKEN FAT, SUGAR, NONFAT MILK, DEXTROSE, GARLIC, SPICES, CHICKEN STOCK, CITRIC ACID. Slowly add 1/2 cup mix to 2 cups hot water and stir well. Simmer for 2-3 minutes. Makes 2 cups sauce. This chicken gravy is perfect for serving over chicken dishes and adding to casseroles and pastas. Use it in filling for pot pies, or as a substitute for cream of chicken soup In recipes.